Damage is almost a guarantee any time a natural disaster strikes your property; the only question is the extent. Nobody can control when a storm will strike or a fire will break out, but you can control how quickly you respond. An immediate response is vital, because the longer water, soot, and other disaster byproducts sit untreated, the more damage they do to building materials and furnishings. ServiceMaster Restoration & Cleaning offers unparalleled disaster restoration services to residential and commercial clients in Atascocita, TX. All of our experts are fully trained and IICRC certified to provide comprehensive restoration services that meet standards set by the ServiceMaster Restore Quality Restoration Vendor Program. We use only the most advanced products and equipment available to the industry to provide the highest quality disaster restoration services. ServiceMaster Restoration & Cleaning restores homes and businesses, as well as larger areas. We give back to the Atascocita community by joining in with relief efforts during major natural disasters. The Better Business Bureau has recognized our efforts three times with their Award of Excellence, and we’ve also been awarded the Angie’s List Super Service Award. Smoke and Odor Mitigation: The smells that accompany sewage backups, fires, mold infestations, and other disasters are overwhelming. Not only do they hang in the air like a woolen blanket, but they infect any porous surface, including textiles and furniture. You can’t put a couch in the washing machine, and even a case of commercially available fabric refresher won’t remove all the odors for good. The professionals at ServiceMaster Restoration & Cleaning have products and equipment not available to the general public that will remove those horrible smells the first time. 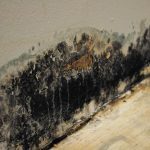 Mold Remediation: Mold growth begins in as little as 48 hours after a water leak, because spores are always present in the air, and modern homes are full of food sources like wood, drywall, and cloth. All they need is moisture to grow. Mold grows and spreads quickly, and if it gets into hidden areas, like inside walls, it can spread undetected and feed on building materials. Even worse, mold spores aggravate allergy symptoms and cause eye and lung irritation even in people who don’t have allergies. ServiceMaster Restoration & Cleaning is licensed by the State of Texas to provide full-service mold remediation in both residential and commercial properties. We test for mold and safely remove all traces of it, even in hidden areas. Fire Damage Restoration: Fires can be caused by so many things that it’s impossible to prevent all of them. Even after the flames have been extinguished, damage is still occurring to your home and its contents due to soot, smoke, and toxins from burning chemicals and byproducts from firefighting products. The longer these toxic materials work, the more items are ruined. As soon as the fire is out and the injured are settled, call ServiceMaster Restoration & Cleaning. We can restore fire and smoke damaged items, even ones you think are beyond saving, as well as rebuild damaged structural elements. In the event of a fire, ServiceMaster Restore is here for you. We are equipped to help with different types of fires whether it be a protein fire or a natural fire. For more information on how we can help watch the video. After a fire, thinking about the financial strain may seem like the last thing you want to do, but it’s important to know the threat a fire can cause. For more information watch the video. Water Damage Restoration: Walking into an indoor swimming pool is one of the most frustrating experiences for a property owner. Whether it comes from a broken pipe or heavy rains, too much water in your home causes a variety of problems, from warping wood to mold growth. Water won’t evaporate on its own; it will spread throughout the structure, rotting and spreading mold as it goes. The experts at ServiceMaster Restoration & Cleaning have heavy-duty air movers and vacuums that will remove excess water and dry the air quickly. We’ll remove any mold and restore damaged areas to prevent future growth. If you have the misfortune to experience any kind of disaster in Atascocita, TX, call ServiceMaster Restoration & Cleaning for comprehensive restoration services. We are available 24 hours a day to respond to emergencies quickly and mitigate damage. Our team works with your insurance adjustor to process your claim as smoothly as possible. Call (800) 303-5844, 24 hours a day, 7 days a week, for disaster restoration services.